Google’s PageRank is a scale from 0-10 that shows how well connected web pages are. Web pages with higher PageRank values have more quality links pointing to them. It is not a linear scale, it is a logarithmic scale. People estimates that the logarithm base is between 5 and 10. Because it is a logarithmic scale it can be quite hard to visualise. I’m going to try to visualise PageRank with some graphs. In these graphs I’m making the assumption that the log base is 5. The first graph shows the values from 0-10 on a linear scale. You can see that when the logarithmic scale is converted into a linear scale the difference between most of the lower numbers completely disappears. That is why these things are presented on logarithmic scales! I’ve added a few websites onto the scale so you can see where they are. As most websites aren’t in the 7-10 range I’ve produced another graph showing just the values 2-7. I’ve made the graph very tall so you can see the difference between the values better. Again I’ve added a few websites onto the graph so you can see what kind of websites get the upper PageRank values. The above two graphs are making the assumption that the base of our logarithm is 5. Would it make much of a difference if it was 10? Yes it would make a huge difference. 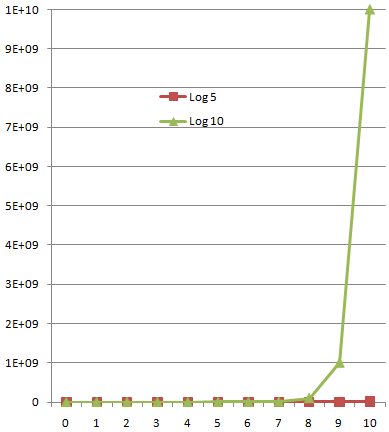 Here is a graph comparing what the PageRank linear values might be for a log base 10 graph vs a log base 5. You can see that it is not practical to plot multiple logarithms on the same graph, so it would make a huge difference whether the logarithmic base was 5 or 10. 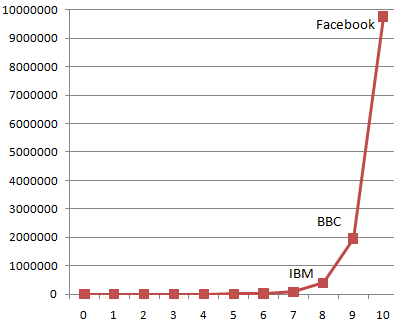 As for whether PageRank really matters – it probably counts for less than most people think. The toolbar PageRank of one of my sites recently went from 2, to 0, up to 3 and back down to 0 again. During these changes I noticed no change in traffic. The actual page contents and TrustRank probably counts for much more than PageRank on most web sites. There are a lot of websites out there telling you how you can make money out of your website or blog. You may have decided to try some of these ideas to make some money out of your web presence. Perhaps you even rely on your web-generated money for a significant slice of your income. If you have then have you ever analysed how secure this income is? Let’s look at a five such risk factors. Like many sites out there you may use Google AdSense. It is quite likely that it is responsible for most / all of your web income. Just imagine if that income suddenly stopped! Is this likely? Well, if you read the many AdSense forums out there it seems that there is certainly a chance of this happening to you. Many people wake up to find an email from Google in their inbox to tell them that their AdSense account has been terminated. The usual reasons for this include either click fraud (clicking on your own ads), or not obeying the AdSense terms and conditions. Unfortunately a lot of people seem to be getting banned through no fault of their own. This usually seems to be as a result of their site being ‘click bombed’. In other words other people deliberately click on loads of the adverts in order to get the site banned. This kind of account termination could happen with any kind of income programme that you use. I’m just using AdSense as an example as there are a lot of documented cases of people having their accounts banned. To protect yourself from this you should use a variety of income generating programmes. If you can you should construct your website in such a way that you can easily switch from one programme to another if you should become banned from one. This also has the advantage that if one programme proves to be a better earner than another, you can switch more of your site to the higher earning one. Another risk factor is related to where your traffic comes from. If most of your traffic comes from one source then you are at risk. As an example it wouldn’t surprise me if 80% of your traffic came from Google. Let’s imagine that next week they introduce a major search algorithm update which sends your site plummeting in the rankings. You could suddenly find that you have hardly any traffic! Other risks include having your site identified as a spam site and being penalised in the rankings or even dropped. Mitigating the risk involves looking at where your traffic comes from and working to get visitors from more sources. For instance getting links on related websites, or getting coverage in other search engines. This particular risk can be very hard to reduce due to the dominance of Google. Your best defence could well be to keep in Google’s good books. Simply sake sure that your site complies with their webmaster guidelines and you should be ok.
All websites go through highs and lows. Sometimes there will be an obvious reason. Your Christmas related website is unlikely to do well in the Summer. Other times you may not be able to work out why your traffic goes up and down. With only a single site you are susceptible to these kind of changes. In general if your traffic goes down then so does your earnings. If you have multiple sites then it more likely you will be sheltered from the peaks and troughs as when one site decreases in popularity another site may be rising. You can think of it like having a balance portfolio of investments. You wouldn’t invest all your money on the stock market would you? If you were sensible you’d probably spread your money through a mixture of stocks, property, and cash accounts. Another kind of risk comes from using just one web host. Think for example what would happen if they went bust? All your sites could disappear in an instant. You may then find it quite hard to get your domains back. Even when you do you may find that you have lost all your search engine rankings, links and visitors. It can happen – about 10 years ago I lost a domain of mine when my host went bust. It was very inconvenient. To reduce the risk first be careful about who you trust to host your website and domain names. Don’t go for a company that looks in any way financially unstable. The second more extreme risk reduction strategy is to use multiple web hosts. This is only really relevant if you have multiple sites. If you have two hosts then you can spread your sites between them. Of course you may now have double the chance of one of your hosts going bust, but at least you aren’t in a all or nothing situation like you were before. Keep a careful record of which domains you own and when they need to be renewed. Hopefully your host will automatically renew them for you. If they do then make sure that they have your up to date credit / debit card details. Good hosting companies will re-register the domain even if they don’t have the correct payment information from you. Not so good hosting companies will release expired domains back into the wild. This can be disastrous as someone else can then quite legitimately register your domain. They will then inherit all your traffic, links and search engine placements. There could be no way for you to get it back. You may notice a theme throughout all my risks. They are mostly about removing the single point of failure to spread the risk. Whenever you rely on just one factor you are at risk of losing everything if that factor should change. Stay safe, and spread that risk around!